When it comes down to it, these are the sort of characteristics that define careers. Skill is essential. Practice is obligatory. Athleticism, desirable, but they'll amount to nothing in the big games if you can't back them up with bottle. Kieran Molloy might be a race horse who looks as though he's finding the distance of the right wing increasingly unfulfilling for a thoroughbred like him and he might well have natural talent that he's constantly honing to go along with it, but he has it between the ears too. And do you know what else? He has it downstairs. Or in the pit of his stomach, wherever it is you muster the sort of mettle he does for the fight. His journey from Tullamore to Santry last February is well-documented, when he left the All-Ireland club semi-final celebrations, after 14-man Corofin made it to the decider, so he could race up the road in time for the second half of the Sigerson final. He came straight on and had a big impact but UCD pipped them in the end. 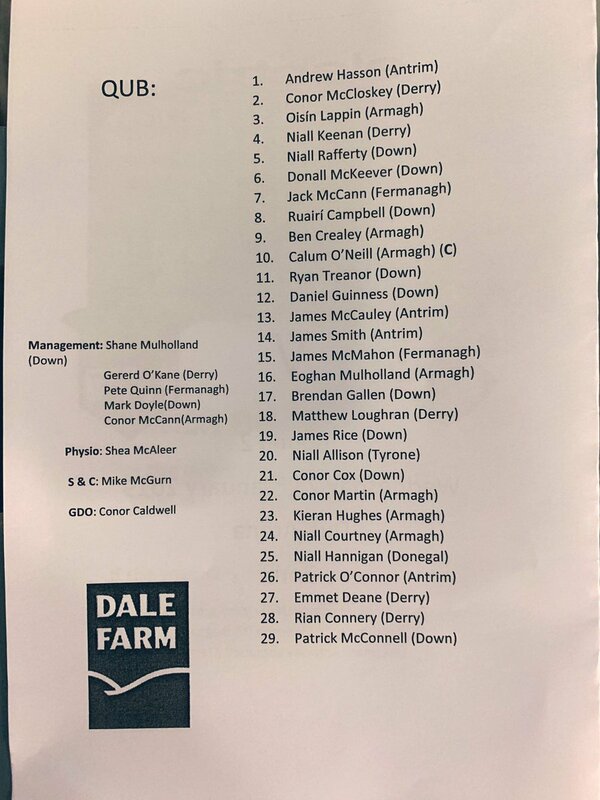 What probably best sums him up is that this year he isn't just back at the same level with Corofin who play Gweedore in the last four, but he's ploughing on with his college again and, one better, he was playing with Galway in the FBD League. 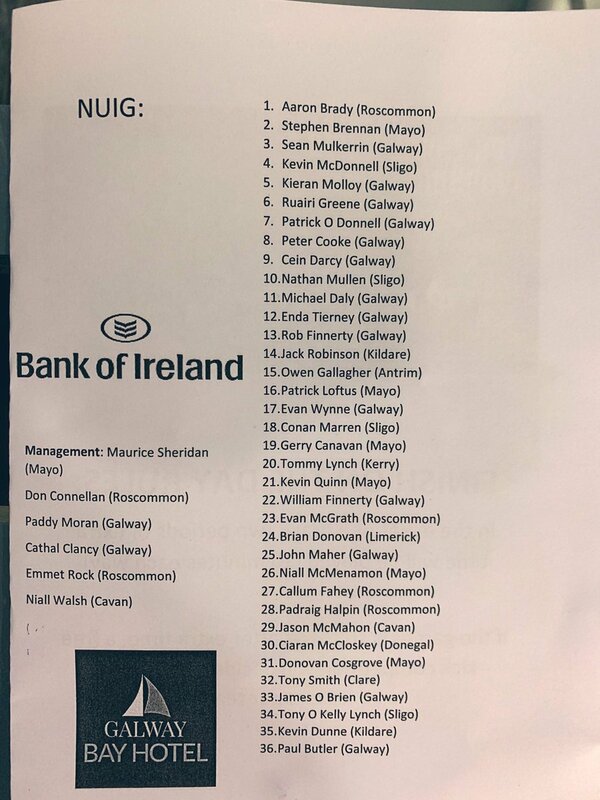 By the time championship came around last year for the Tribesmen, only one Corofin player - Ian Burke - made it onto the county's starting 15 and, despite coming on against Dublin in the semis, Molloy looks like he's set on having a bigger influence in the maroon in 2019 by juggling county, college and club commitments. 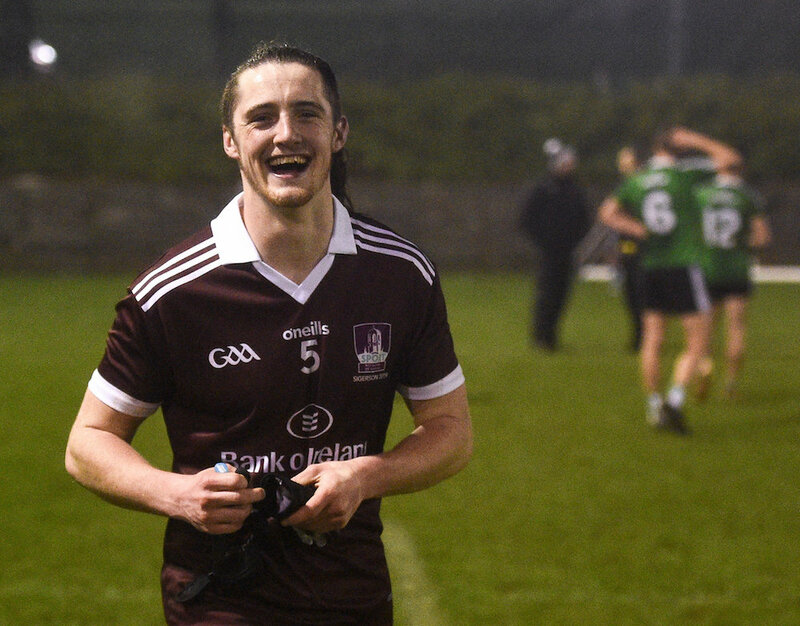 On Wednesday night, NUIG showed serious bounce-back-ability when they ground out a one-point win in Belfast over Queen's in the Electric Ireland Sigerson Cup. 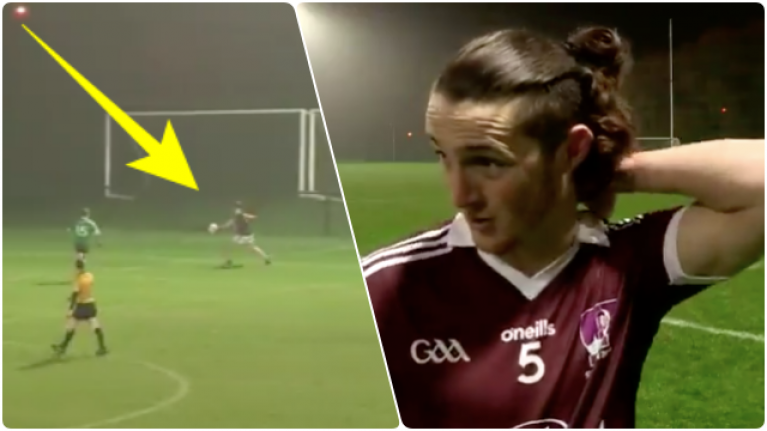 Having lost a free-taking shootout to St. Mary's last week, the Galway outfit needed a response but it was always going to be tough up at the Dub, the home of Queen's football, but they dug it out. Team sheets courtesy of the brilliant Philly's Updates. In a low-scoring game, every opportunity was vital but it was a half-opportunity that would prove decisive with Molloy striking the winner in a 1-8 to 1-7 win. 13 metres from the end line, tight to the right wing sideline, Molloy dropped the ball to the outside of his boot and let fly an almighty game-changer that clinched the W.
And his fellow county man Céin D'Arcy also played a pivotal role by scoring the goal which ended up with a bit of luck but was forced through by sheer explosiveness. The basic mathematics are that strength and speed make up power - the size of the force you can generate and the velocity at which you can generate it determines the power you produce. Céin D'Arcy is a powerful man. Strong and fast and downright direct, he has the fundamental components to conjure up a frightening energy that would force its way through many an obstacle. On Wednesday night, when he decided to pump the afterburners, it was good night Irene as he charged right through the heart of the Queen's defence - a defence that leaked just nine scores in 60 minutes - he left bodies trailing on the ground and he went straight for the jugular with ruthless power. Both his and Kieran Molloy's pieces of respective brutishness and magic were captured yet again by Jerome Quinn. Afterwards, Molloy reflected on the win. "It's tough to come up here, it's a long journey and to grind out a win like that..." he spoke with Quinn. "They're a very tough team to break down. They're big, physical men - fast. I thought the lads showed a lot of character - two points down, came back and then went three points up. I thought it showed immense character. "I was lucky enough it [his winning point] went over, I kind of had my eyes half closed kicking that one."